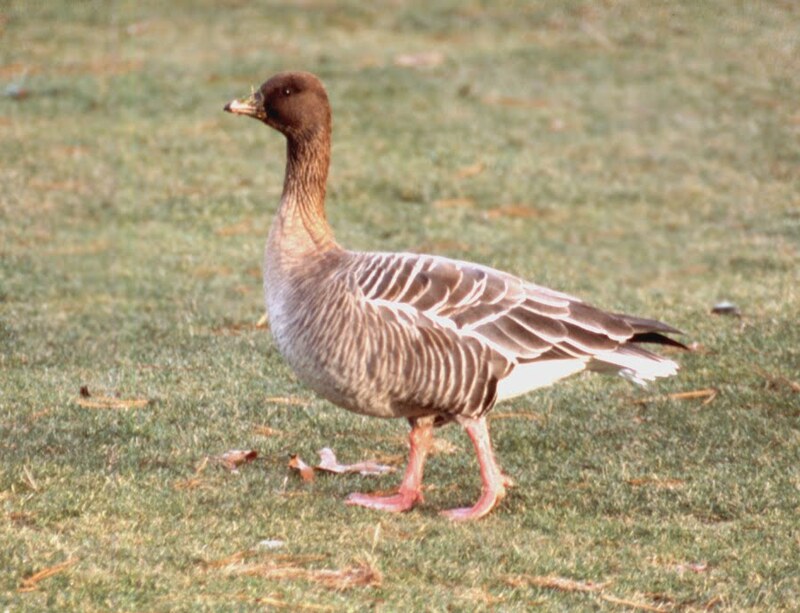 Pink-footed Goose breeds in e. Greenland, Iceland, and Spitsbergen and winters in nw. Europe. The population is increasing and vagrants in the Northeast are occurring with increased frequency. The first two Massachusetts records for Pink-footed Goose both hailed from Cape Cod during January. Both birds have been found among Canada Goose (Branta canadensis) flocks and have been widely seen and well-photographed. The 1999 bird was initially considered “origin uncertain”, but is currently being rereviewed. STATUS IN THE EAST: The population of this species is growing rapidly in Iceland and Greenland. The first records from North America were from Newfoundland (10 May-3 Jun 1980; AB 34:755) and Quebec (6-21 Oct 1988). Since that time, there have been a number of additional records from Newfoundland (including a small flight in spring 1995), Connecticut, New York, Pennsylvania, Delaware, and Quebec. Recent records from Rhode Island (two, Jan-Feb 2007, Newport) and Long Island (two, Nov 2007-Feb 2008) were thought to possibly pertain to the same wandering individuals. Some thought that the Massachusetts record and one in New York in 2009 may have pertained to the same individuals wandering separately, but we consider it unlikely given that goose pairs mate for life and that the rapid increase in eastern records supports the notion that multiple individuals might occur in the East in a given year. Some analyses were done of bill patterns of Pink-footed Geese on the East Coast in 2012-2013, and similar analyses might shed light on past and future records. IDENTIFICATION NOTES: With good views, this species is distinctive with its stubby dark bill with a pinkish saddle, pink legs, and grayish body plumage. One Massachusetts record was briefly considered to pertain to Tundra Bean-Goose (Anser fabalis) or Taiga Bean-Goose (Anser serrirostris), but good views of the bill structure and leg color eliminated that possibility (bean-geese have orange legs vs. pink on Pink-footed). Tundra Bean-Goose has occurred in Nebraska and Quebec and should be considered a possible but extremely unlikely vagrant to Massachusetts.